It’s not given to human beings to have such talent that they can just know everything about everything all the time. But it is given to human beings who work hard at it – who look and sift the world for a mispriced bet – that they can occasionally find one. During a visit to Columbia Business School many years ago, a student asked Warren Buffett how one could best prepare for an investing career. Mr. Buffett picked up a stack of financial reports he had brought with him and advised the students to read “500 pages like this every day”. One of the students in the class happened to be Todd Combs. Mr. Combs took the advice quite literally and eventually got into a habit of reading far more than 500 pages per day. This work ethic contributed to a successful career running a hedge fund and a position at Berkshire Hathaway allocating several billion dollars of capital. The truth is that few individual or professional investors come close to reading as much as Mr. Buffett recommends. But even if one is willing to dedicate the time and effort required, surely the areas one looks at are just as important as the sheer volume of reading. Before allocating a dollar of capital, it is necessary to wisely allocate time to examine ideas in areas most likely to be fruitful. One of the indispensable sources of actionable investment ideas for value investors is The Manual of Ideas which has been published as a monthly periodical for several years. Each issue presents profiles of twenty value investment ideas along with other features such as interviews with prominent investors and proprietary rankings and analysis of superinvestor portfolios. 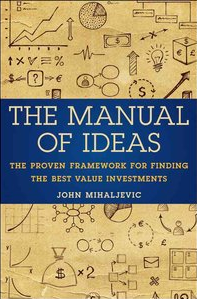 John Mihaljevic, Managing Editor of The Manual of Ideas, recently published a book also named The Manual of Ideas. As opposed to being a manual of potential investment ideas, the book provides insight into the process Mr. Mihaljevic uses to identify compelling opportunities. As Mr. Mihaljevic acknowledges in the first chapter, investing is a very personal endeavor even though nearly all active investors have the same ultimate goal of making money and outperforming passive strategies. An approach that works very well for one individual may completely fail for someone else who brings to the table a different temperament, set of skills, interests, and innate analytical capabilities. Blindly copying the advice of an investment publication or the actions of well known investors usually fails to produce the desired results because an investor will lack the conviction required to manage through adverse times. One must know their own circle of competence along with the rationale for each investment in the portfolio in order to have the fortitude to persist when Mr. Market marks down a typical portfolio by 50 percent or more, as was the case during the 2008-2009 bear market. One of the investment approaches that we have found particularly compelling is Joel Greenblatt’s “Magic Formula”. Those who are not familiar with the magic formula often instinctively recoil at the idea that one can apply any formula, let alone a “magic” one in the field of investing. Indeed, the name of the strategy may be unfortunate because the idea is simply to look for investment opportunities in fundamentally sound businesses (ranked by return on capital) selling at cheap prices (ranked by EV/EBIT). There is no “magic” involved. We recommend viewing a brief interview with Mr. Greenblatt for those who are new to his approach. Of course, no formula in the hyper-competitive field of investing could last for long if it could be applied easily and ensure superior short term results. Quick adoption of the formula would erase this opportunity and it would cease to work. However, the magic formula continues to work because although it produces superior long term results, short term results can often underperform benchmark indices. This eliminates the formula from the toolkit of the vast majority of investors who care about beating the market this week, month, or year. In addition, the type of companies that come up in magic formula searches are typically ones that have problems that are perceived as very serious and could impair the underlying economics of the business making historical return on capital a thing of the past. Mr. Greenblatt has provided a free screening tool at his Magic Formula website which we can use to illustrate the difficulty facing an institutional investor actually attempting to adopt the strategy. We ran a search to find the top thirty companies with market capitalization of $1 billion or greater that qualify for the magic formula strategy. Included in the list are companies that may have been “good” businesses in the past in terms of return of capital but are now selling at “cheap” prices due to predominant pessimism in the investing community. A few that immediately jump off the page are tobacco companies Altria Group and Lorillard, technology companies facing potentially moat-destroying fundamental changes such as Hewlett Packard, Microsoft, Oracle, and Seagate, and a company such as Herbalife which has been accused of being a pyramid scheme by well respected value investors. There is less “career risk” involved in posting mediocre returns on par with one’s peers than with seriously underperforming a benchmark for several years while being invested in controversial companies that most investors dislike. These factors ensure that the magic formula will have a good chance of continuing to produce compelling undervalued investment ideas in the future but even investors who do not face “career risk” must acknowledge that the stomach churning reaction to many of the magic formula candidates might make this approach less than compelling if the result is that investments are sold in response to Mr. Market further marking down the shares. So here again we have another psychological hurdle to overcome in order to successfully deploy the magic formula. Few enterprising investors will believe that laying their own well thought out criteria over a list produced by the magic formula will hurt results but chances are that this is exactly what will happen if one adds additional tests such as insider buying and selling, insider ownership, and other factors that normally represent constructive factors in the analytical process. Fortunately, Mr. Mihaljevic directs the investor’s enthusiasm for layering additional analysis on top of the magic formula toward areas of inquiry that may help improve the overall results and, perhaps as importantly, result in a level of conviction for the ideas that will allow an investor to see the idea through a period of adverse stock price movements. Mr. Mihaljevic recommends that we attempt to understand whether magic formula selections “exhibit above average returns on capital for transitory reasons or for reasons that have some permanence.” In addition, it is important to understand whether a company reporting high returns on capital has reinvestment opportunities also promising high returns on reinvested capital and, if not, whether management has demonstrated intelligent capital allocation practices in the past. Although the magic formula chapter is more than worth the price of the book, similarly valuable insights are provided for the eight other chapters mentioned above. Not all investors will be interested in every strategy but that is perfectly fine since there is usually more than enough to do in areas that are appealing. Also, it never hurts to broaden one’s thinking when it comes to different approaches. This is all part of attempting to expand the circle of competence over time. It is rare in today’s hyper-competitive investing world to come across publications that add value when it comes to presenting either specific investment ideas or an investing framework that could result in more competitors. The Manual of Ideas periodical has for many years provided actionable investment ideas and now the book has revealed important timeless insights that should improve any investor’s framework. Earthquake Forecasting: Beyond a Crystal Ball?